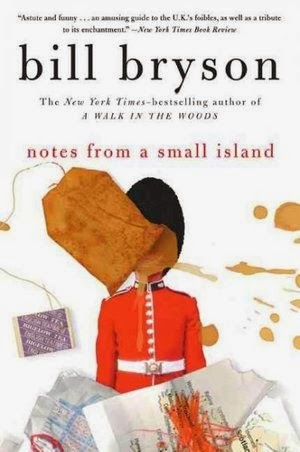 This book combines several of my favorite things: travelogues, England, and the charm of Bill Bryson. It is the book version of comfort food. So you can understand why I instinctively reached for this audiobook on the the first day of my new job. I wanted something comforting. And humorous. And British. "If you mention in the pub that you intend to drive from, say, Surrey to Cornwall, a distance that most Americans would happily go to get a taco, your companions will puff their cheeks, look knowingly at each other, and blow out air as if to say, 'Well, now, that's a bit of a tall order,' and then they'll launch into a lively and protracted discussion of whether it's better to take the A30 to Stockbridge and then the A303 to Ilchester, or the A361 to Glastonbury via Shepton Mallet. Within minutes the conversation will plunge off into a level of detail that leaves you, as a foreigner, swiveling your head in quiet wonderment ... Give two or more men in a pub the names of any two places in Britain and they can happily fill hours. Wherever it is you want to go, the consensus is generally that it's just about possible as long as you scrupulously avoid Okehampton, the North Circular in London, and the Severn Bridge westbound between the hours of 3 p.m. on Friday and 10 a.m. on Monday, except bank holidays when you shouldn't go anywhere at all." The whole book was immensely enjoyable. The plan was for Bryson to take a last tour of England before he and his family moved to America for a few years. (Bryson is from the States, but his wife is British.) He was going to travel mostly by public transportation, because his wife wouldn't let him have the car. (HA!) There did not seem to be a logic to his journey -- instead he went hither and thither as he desired, sometimes jumping on a bus or train if it happened to arrive while he was standing there. A few times he broke down and rented a car or took a cab, but he always gave a good reason. As someone who has not visited England in more than 15 years (and what a sad realization it was to do the math), I could only relate to a few stops on his journey. But I still loved his meanderings and his musings. And I will continue to find more Bill Bryson audiobooks because they are just so delightful. "I can never understand why Londoners fail to see that they live in the most wonderful city in the world. It is, if you ask me, far more beautiful and interesting than Paris and more lively than anywhere but New York -- and even New York can't touch it in lots of important ways. It has more history, finer parks, a livelier and more varied press, better theaters, more numerous orchestras and museums, leafier squares, safer streets, and more courteous inhabitants than any other large city in the world." "I spent two days driving through the Cotswolds and didn't like it at all -- not because the Cotswolds were unlovely but because the car was. You are so sealed off from the world in a moving vehicle, and the pace is all wrong. I had grown used to moving about at walking speed or at least British Rail speed, which is often of course much the same thing." "I have a small, tattered clipping that I sometimes carry with me and pull out for purposes of private amusement. It's a weather forecast from the Western Daily Mail and it says, in toto, 'Outlook: Dry and warm, but cooler and with some rain.' There you have in a single pithy sentence the English weather captured to perfection: dry but rainy with some warm/cool spells. The Western Daily Mail could run that forecast every day -- for all I know, it may -- and scarcely ever be wrong."